14 weeks. 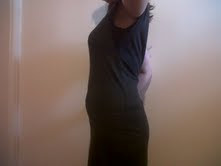 The second trimester! We have made it so far! It's hard and not flabby fat, but I still just feel kind of fat really. Hope your house sells soon and that you find your new home soon too. ^ And you work out west and so do I! (I work out at Norwest. Ahaha, your pregnant tummy is my normal tummy! I have always had a pot belly, even in pics of me as a kid it's there. Can I recommend full skirts, if not too uncomfortable? Yay for the first bump photo! Good luck with everything re: your house and finding your brand new home! Ahh what a cute little belly!! That stage between looking normal and looking pregnant is a bit of a pain.. but you will be popping out before you know it! Congrats on reaching the 2nd trimester.. enjoy it! Hopefully you are feeling more energetic and less sick and it all starts to feel really exciting..
Hope the home open went well! What a cute bump. Looking forward to seeing the follow up photos. Again, good luck with the house selling / hunting. Looking good hon! Try to enjoy wearing your normal clothes now before they get stored away!